NEW PROMO ITEM: Seed Sticks! We're extremely excited to now offer our new item, Seed Sticks. In a compact and cute matchbook-style booklet, printed with up to 4 colors (or full-color), users can plant herbs, spices, garnishes, flowers, and more in their home or kitchen simply by tearing off a stick from inside the pack and popping it in fresh soil-- just add water and there ya go! In about 10-14 days after planting, the beginnings of an herb garden or a home spice-rack will have started to sprout. Restaurants can give away spices and herbs that go with their cuisine. Distilleries and liquor brands can give away garnish seeds attached to their bottles. Plant nurseries and garden shops can show off a sample of their flower offerings. The possibilities for branding cultivation are there for the taking! Seed Sticks are a great new item with a lot of wonderful applications. It's truly a booklet that is alive and growing. Let's get your advertising and branding to do the same thing. Click here for pricing and more info. Quick Digital Matches & Napkins NOW! Admatch now has a great line of full color quick turn around box matches and cocktail napkins. Perfect for weddings, parties, BBQ's, one-off promos, and other events where low quantity and high quality are needed. Printed digitally CMYK, these items can handle full color prints. Quantities starting at 200. Turn around times starting at 6 business days after proof approval. Click here for napkins. Click here for matches. See Our Flexoghraphic Hi-Rez Product Line! 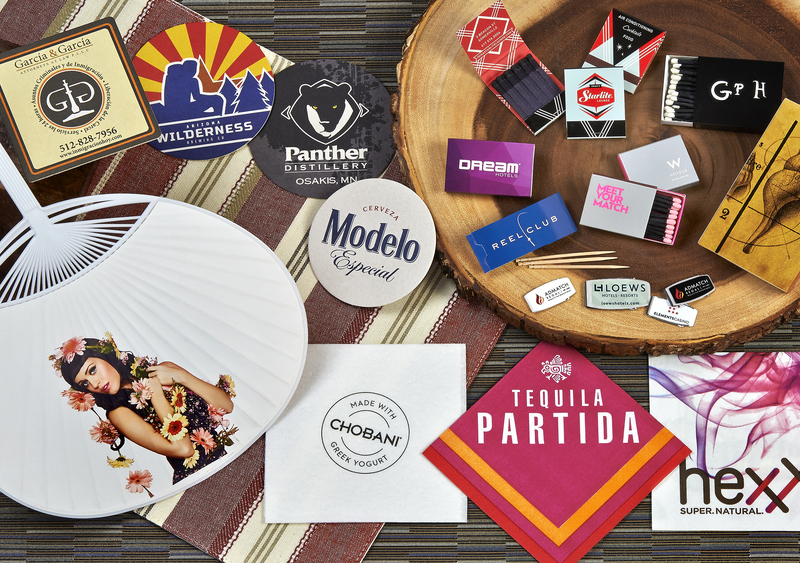 High-resolution full color, vivid images printed on napkins, cups, food containers, and plates. These things look amazing--- the cream of the crop for printing. Our flexographic line gives you all the possibilities for that perfect promotional "wow-factor!" Click here to check it out!